“Maybe we should all get together and do something to help,” Mark Stuart propositioned the group. The Riverdale Senior Center’s Rap Group meets regularly to discuss current events and to stay informed. The discussion had turned to Hurricane Maria and the devastation that was caused in Puerto Rico. Ariana Holback had mentioned that Assemblyman Dinowitz prepared a list of desperately needed items being collected at a local firehouse. With those few words as a call to action, the Seniors marshalled their resources, and before the week was out they raised over $1,000 in cash and gathered donations in the Riverdale Y lobby. The local firehouse was collecting first aid supplies, batteries, baby food, diapers and feminine hygiene products. A team of four women, Ariana Holbeck, Loyda Camacho, Winnie Berrios and Debbie Leonardo got in their cars and went to Costco. A shopping spree ensued and in an hour and a half they had a flat-bed cart full of big pamper boxes and two other carts brimming with the supplies. 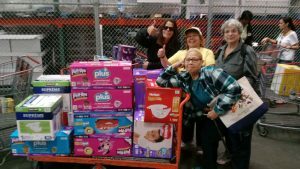 After their shopping spree on behalf of the Puerto Rican people, Riverdale Y bus drivers took all of the supplies to The Inwood Fire Department for immediate shipment to Puerto Rico. They were greeted with warmth and surprise. One fireman noted that the Riverdale Seniors’ collection was the largest donation they had received to date for Puerto Rico. After completing their successful relief efforts, the Seniors immediately asked to keep the box in the lobby, as they continued their drive to help our beleaguered Puerto Rican cousins. When asked if she was tired, one of the Seniors noted, “Sometimes you just have to keep going if you want to make a difference.” And the Riverdale Y Seniors are not afraid of a little extra work.